Our indication of time is based on 24 hours a day, 60 minutes per hour and 60 seconds per minute. Many so-called "binary" clocks that are available also use the 24:60:60 format to render the time, by replacing the digits by binary numbers. Simply put: not very geeky, as it is as far away from binary as possible. Here's true binary time, and some wall clocks that display time in this binary format. In true binary time, a day is split up in two halves, representing the first and second half of the day. These two halves correspond to 12 hours each in 24:60:60 time. The first (most significant) bit of binary time is 0 if the current time of the day is before noon, and 1 after noon. Each next bit splits this time frame in two equal portions. The second bit denotes a 6 hour time frame, the third 3 hours, the fourth 90 minutes, the fifth 45 minutes, the sixth 22 minutes and 30 seconds, and so on. The 16th bit would represent a 1/65,536th part of a day, which corresponds to 1.318359375 seconds. In true binary time, what we're really interested in, are the most significant bits of the binary number. Instead of dropping leading 0s in binary numbers (i.e. 10110 == 00010110), true binary time is represented by the most significant bits, and by trimming trailing 0s. Midnight in true binary time format would be 000000000... or 0. Noon is 1. Six o'clock in the morning is 01, where six o'clock in the evening is 11. The more bits in the format, the more precise you can tell time. Below is a Flash version of a real time true binary clock, which displays the 20 most significant bits of your computer's current true binary time. See if you can read it. Putting true binary time on analog wall clocks render intricate fractal patterns, since the binary time format is fractal in nature. Below is my design for an analog wall clock that allows you to read both the common analog 12-hour format and true binary time. Since both time formats are displayed, it brings true binary time to everyday life, without it getting all too confusing. 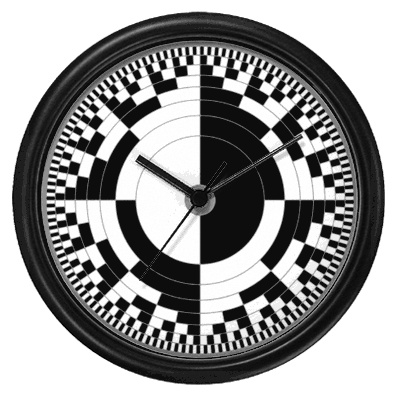 You can order this clock online at Cafepress. On this clock, one can read the time in both a 12-hour format (as you would on any other analog clock), and bits 1 through 9 of the corresponding true binary time. For reading the true binary time of this clock, you must consider the position of the hour hand, with respect to the concentric bands on the clock's dial. The most central band, splits the clock face in two portions. The right half (where bit 1 of true binary time is 0) denotes the first 6 hours of a 12-hour rotation of the hour hand. The left half then signifies the second time frame of 6 hours within a rotation of the hour hand. The second band (from the center) divides the clock in 3 hour portions, the third band divides the clock in 8 time frames of 1.5 hours, and so on. The outer band cuts the clock face into 256 parts of 2 minutes, 48 seconds and 750 milliseconds. Since binary numbers aren't just enough to satisfy all geeks' cravings, here's a different version of the wall clock that adopts the gray code binary format to indicate the true binary time. 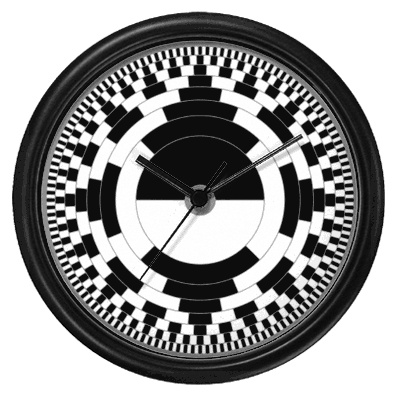 You can also order this clock online at Cafepress. Copyright 2006 Anthony Liekens. This design is protected by copyright law in the USA, the European Community and the rest of the world. The concept, information, implementation and patterns on this page can be used for non-commercial purposes only. Any unauthorized use is a violation of copyright law and will result in legal action.